Posted in Cooking & Nutrition on September 9, 2011. Last modified on April 02, 2019. Read disclaimer. In their Dietary Guidelines for Americans 2010, the U.S. Dept. of Agriculture and Dept. of Health and Human Services recommend that approximately 1/3 of our diet should consist of grains. And of this, at least 50% of the grains we eat should be WHOLE grains. Unfortunately, less than 5% of Americans eat this amount. Health Quiz: Which three of the following can you normally expect to be whole grain foods? (We say normally because, unless the product's label specifically says "whole grain", the other thirteen products are normally made from refined grains). Whole grains contain all three parts of the grain seed (kernel): bran (a hard layer, under the seed hull of chaff), starchy endosperm (what is ground to produce white flour) and germ (the embryo or reproductive part of the seed). When refining grains to produce white flour, white rice, etc., the bran and very nutritious germ are removed to produce a finer texture and longer shelf-life. (Since the bran and germ have a high oil content they can become rancid much sooner if not frozen or refrigerated. Because the discarded bran and grain are nutrient-rich, grain processors often enrich or add back select vitamins and minerals. Some vitamins, minerals, protein, essential fatty acids and dietary fiber from the bran and germ are simply lost, however. Another drawback of many refined grain products is that they are higher in added sugars and solid fats, so they contain more calories. Whole grains can come in the forms of processed foods, such as cereals, crackers, baked goods or pasta, as well as the the whole, rolled or cracked grains that you cook, like rice or oats. 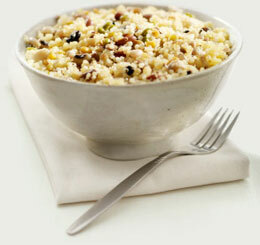 For a healthy meal in a hurry, see our recipe for whole-grain, vegetarian Spanish brown rice with beans and corn. Products may display phrases such as 100% Wheat, Multi-Grain, Cracked Wheat, Seven-Grain or even Stone Ground yet not contain any whole grains. Look for "whole" or "whole grain" in front of all, or at least the first couple ingredients on the product label. Cooking time for grains can vary depending on the age of the grain, specific variety, cooking method and personal preference. Tip: To reduce cooking time and improve digestibility, presoak grains in their cooking water for 1 hour -- or even overnight. Add a pinch of salt to water before boiling. You may also consider buying an electric rice cooker. This versatile kitchen appliance can be used to cook almost any grains. Just add your desired amounts of grain, salt and water, turn it on and forget about it. The rice cooker is smart enough to recognize when the water has been absorbed and the grains are done.